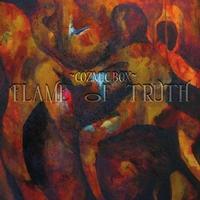 Flame of Truth by Cozmic Box fits into the realm of progressive rock and is quite a strong disc. However, it’s not perfect. 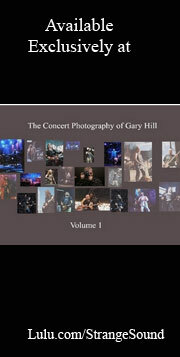 Still, its blend of modern and classic prog influences should make it a real winner with prog rock fans. A little editing and rearranging of tracks would have made Flame of Truth stronger. Even with those flaws, though, the disc is a great one. Cozmic Box should be a band for all progressive rock fans to follow. The album opens with a short, but pretty progressive rock ballad motif that calls to mind early Genesis. The vocals on “The Beautiful Plan, Pt. 1” really do sound quite a bit like Peter Gabriel. While beautiful, it’s dark and melancholy in nature. The music that brings in the title track resembles Pink Floyd quite a bit. It’s got a driving rhythm section with a lot of keyboards laid over the top. The vocals again call to mind Peter Gabriel, bringing a bit of a Genesis air to this number, as well. 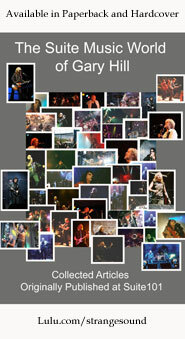 There are some noisy guitar parts circling over the top, like sharks waiting for a kill, which brings a dangerous and more modern progressive rock edge to the piece. This is an instrumental that does a great job of sitting between Pink Floyd and Genesis. As “Single Minded Theory” powers out from there, though, the disc takes a turn towards fusion. Those Pink Floyd elements are still present, but there is an air that’s closer to Al DiMeola or Spyro Gyra. There’s some tasty melodic guitar work built into the arrangement later, too. This has a real accessible nature to it. It’s a melodic, balladic-like piece. The vocals on the track call to mind Fish, but since that artist has always been considered heavily influenced by Peter Gabriel, the connection makes sense. While there are some elements of progressive rock in some of the instrumental movements later in the piece, it is really very much an AOR tune. “Better Way” is an evocative and melancholy sounding ballad that’s powerful. The references to Pink Floyd are again valid, but there’s a lot of more modern progressive rock built into it, too. The hard-edged, but slow moving guitar solo dominated section later in the piece is very much in keeping with something from Pink Floyd. Whatever the mix, though, it’s one of the best numbers of the whole set. The gentle music that makes up “Dreaming of You” is in keeping with early Genesis. The female vocals are a nice touch. Even when the track powers out later, it still retains a lot of that Genesis sound, but with a bit of Pink Floyd added to the mix. There’s a short answering machine message at the end of the piece. This is decidedly progressive rock oriented, but perhaps closer to modern prog. That said, it’s hard to pin down, feeling at times like Porcupine Tree or RPWL and other points a bit like Spock’s Beard. The vocal performance is powerful and the cut has a great groove to it. An air raid siren and harder edged prog leads off “Trance War.” In a lot of ways the cut seems to combine the sounds of Pink Floyd and Hawkwind with some hints of fusion built into it. There are some looped bits of speeches, but otherwise this is an instrumental. It’s a bit too repetitive, though, and for that reason is one of the lesser pieces on the set. There’s a real groove to “Winter Haze,” another instrumental. It’s also another cut that drags on too long without enough variety. It wouldn’t be as evident, though, if it were positioned elsewhere on the disc. Still, there is some great guitar soloing built into the piece. In another poor decision in terms of pacing of the disc, “What's That?” follows. It’s a bad decision because it places three instrumental right in a row. That said, other than an overly electronic sounding drum beat, this cut (with bits of sound bites about the supposed Roswell UFO crash) is stronger than the two that preceded it. If there is a true misstep on the set, this is it. First, it’s poorly placed because it’s the fourth (essentially) instrumental number in a row. Secondly, it’s too chaotic and seems a bit too much like noodling. It’s just weird musical ambience with a guitar soloing aimlessly over the top throughout much of its length. Another instrumental, “Seamstress of Now” follows “Cozmic Chaos.” The track feels a lot like Hawkwind, and is a step up, but it’s a bad decision in terms of the layout of the set to put this many instrumentals back to back. The closer creates a bookend with the opening number.